Bahá’ís are all those women, men and youth, coming from all nations, races, religions, cultures and societies of the world and who have accepted the message of Bahá’u’lláh. Bahá’u’lláh, who was born in Iran in the last century (1817-1892), suffered throughout all His life to bring His Message: He has been exiled, persecuted, tortured, chained and confined to long years of imprisonment. Moreover, after having been deprived of his personal goods and properties, His family was decimated and more than 20.000 of His followers have been killed. The Message carried by Bahá’u’lláh is of the SPIRITUAL AND SOCIAL UNITY OF THE WORLD. There isn’t a God for the Christians, another for the Hindu, and one for the Muslims, but God is only One for humankind. God has revealed Himself at different times in history through Manifestations of God, Who have educated mankind. The existing religions are the expressions of these Revelations, and their apparent diversity is due to the varieties of cultures and historical period in which there religions have appeared and flourished. SPIRITUAL UNITY: all religions come from God, and they must be a source of harmony, love and justice. Religion, Bahá’u’lláh says, is not about rituals, cults, ceremonies and dogmas, but it is an individual deep spiritual feeling and consequent behaviour in life. POLITICAL- ECONOMIC UNITY: all nations may become one Planet, with a world government, an international law, a world currency, a universal language, one common faith. SOCIAL UNITY: we are all flowers of one garden, waves of one sea. Baha’u’llah regards human beings as flowers of one garden: despite their differences in species, colour and shape, because they are refreshed and nurtured by the same water and thanks to their diversity, acquire even more beauty. How unpleasant to the eye would be if all the flowers had the same shape, same colour and same fragrance. On the other hand, the garden is enriched and beautified by the diversity of colours and difference, whose effect and impact are much greater. Similarly, this applies to human beings in the world. HISTORY: Bahá’u’lláh had a forerunner known as the Bab (The Gate). The Bab began His Revelation in 1844 in Persia, announcing the advent of a great Manifestation of God. After 6 years, He was martyred. Soon after, Bahá’u’lláh (Glory of God) revealed Himself and He was persecuted and exiled first to Iraq, then to numerous prisons in the Ottoman Empire, and later to the prison of Akka (Palestine) where He passed away in 1892. 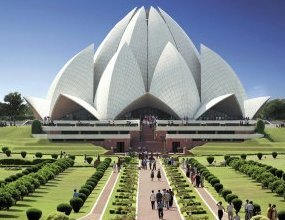 In this part of the world the Baha’ìs have their Holy Places and World Administrative Centre. The first son (1844-1921) known by the title ‘Abdu’l-Bahá (the Servant of the Glory), after having being imprisoned after his father, was released and engaged in promoting the teachings of Baha’u’llah in the western countries (United States and Europe). Baha’u’llah, from the prison of Akka, sent, without results, tablets and written exhortations to numerous kings and rulers of that time: Napoleon III, the Queen Victoria, the Czar Alexander, the Pope Pius IX, Francis Joseph of Austria, the powerful Sultan of the Ottoman Empire Abdul Aziz, the Shah of Persia, etc, exhorting them to end political and religious divisions, and encouraging them on the path towards WORLD PEACE. DIFFUSION: Bahá’ís reside in all the countries of the world. There are about 140.000 communities spread in the five continents with baha’ìs representing all races, religious backgrounds, nationality, culture existing. They actively collaborate with many international organisations: UN, ECOSOC, UNICEF, FAO, WWF, WHO, and with specific projects in the field of education, peace, agriculture, natural resources conservation and health. HOUSES OF WORSHIP: Baha’ìs have 7 Houses of Worship, one for each area of the world: United States, Central and South America, Europe, Asia, Africa, Pacific Island and Australia. The House of Worship is developed with 9 sides which symbolically represent the existing main 9 religions. On each side, there is a door which is dedicated to each religion, from where followers of all religions can enter. Each House of Worship has also a dome which represents the unification of all religions under One God. Inside, there are no images or rituals, and Writings from all religions are read. The House of Worship is surrounded by social institutions aimed at education of humanity. These institutions are places such as schools, universities, hospitals, old aged houses, etc. These aim to represent that all human activities have a spiritual source. ORGANISATION: The Bahá’í Faith doesn’t have clergy. Bahá’ís have elected Institutions at the local, national and international level, which coordinate all the activities at the three societal levels. 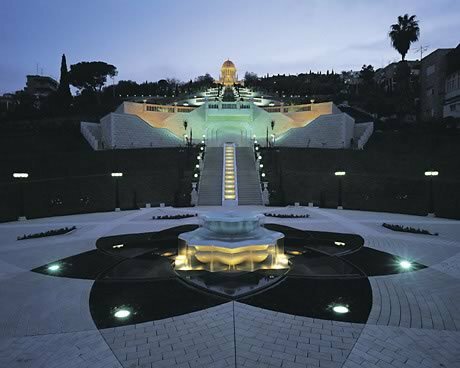 The Bahá’í World Centre is located in Haifa, on Mount Carmel, adjacent to the Resting Place of the Founder, and it is surrounded by marvellous gardens known all over the world. Here resides the Baha’ì international supreme Institution, the Universal House of Justice, which is elected every 5 years. Bahá’í Writings have been translated into all existing languages. Bahá’ís are present in about 400 localities and communities on the entire Italian territory. The national institution, the National Spiritual Assembly of the Baha’ìs of Italy ( Via Stoppani 10 00100 Roma – Tel 0680796477 ) is recognised from the Italian government as an independent Faith. Local Spiritual Assemblies operate in about 60 cities. Bahá’í literature and Writings in Italian are edited and published by the Bahá’í Publishing Trust. Equal distribution of riches and resources of the earth.